Michael Johnson ended up having a very good end to 2013 after pitching a shutout against Joe Lauzon in his hometown of Boston before knocking out Gleison Tibau at UFC 168 in December. All told, Lauzon and Tibau have a combined 23 victories inside the Octagon and a great win percentage overall, so Johnson besting both inside of six months was a very proud accomplishment. As a former Ultimate Fighter finalist, Johnson knew it was only a matter of time before his own ambitions caught up to the training he was receiving at the Blackzilians camp in Florida and now the chemistry is producing spectacular results. "It’s all coming together now," Johnson told FOX Sports on Friday. "All the hard work is coming together. The two and a half years that we’ve been doing the striking with Henri (Hooft) is coming together, the jiu-jitsu, the wrestling, everything’s starting to catch up now so it’s perfect." Following his knockout win in December, Johnson wasted no time taking to Twitter to call out his next opponent. Johnson has requested a fight with former UFC lightweight title contender Nate Diaz, and he’s not backing down from the challenge because it’s exactly the kind of matchup he’s been waiting to land. Johnson looks at Diaz as a dangerous opponent, but also the kind of fighter that can push him closer towards his ultimate goal, which is a shot at the UFC lightweight belt. While Johnson insists it’s not personal with Diaz, he will be the first to admit there are things about the Stockton, California native that rub him the wrong way but in the end he’s still a top ten lightweight and that’s what he wants. "He’s a guy that I know is going to go in there and fight me. Not saying Joe (Lauzon) or Gleison (Tibau) didn’t, but I know I’m in for a fight when I’m fighting Nate Diaz and that’s the only reason I’m calling him out. It’s not because I’m bad mouthing his game or anything. He’s one of the better guys in the division and I want to be the best. To be the best you’ve got to fight and beat the best," Johnson said. Michael Johnson and Gleison Tibau exchange punches in their lightweight bout during the UFC 168 event at the MGM Grand Garden Arena on December 28, 2013 in Las Vegas, Nevada. "He’s a guy that I’ve always wanted to fight. I don’t really like his attitude, he talks a lot of sh*t, but that’s perfect for me. Those are the guys I like to fight." Diaz has been a top lightweight contender for the past few years working all the way to a title shot against then champion Benson Henderson in December 2012. Diaz came up short there and actually lost in his next fight as well to Josh Thomson, but returned to form in early December when he knocked out rival Gray Maynard at The Ultimate Fighter 18 finale show. Beyond his own fighting acumen, Diaz is an extremely colorful character both inside and outside the cage. He’s pushed opponents at press conferences, knocked off a hat in the past, and much like his brother Nick, the younger Diaz has no problem spouting off during a fight and even tossing a few obscene gestures or four letter words at an opponent. I’m looking forward to him running his mouth and trying to get in my face getting his little mean mug on. Johnson welcomes those kinds of antics from Diaz if he lands the fight. He’s not really sure what Diaz is trying to prove with his attitude, but it serves as the perfect motivation to stomp him inside the cage if they fight. "I would love that. I’m looking forward to that actually if we get this fight," Johnson said about Diaz’s demeanor before and during a fight. "I’m looking forward to him running his mouth and trying to get in my face getting his little mean mug on. He looks like a little kid when he does that, like a five year old little mean kid. That’s what I’m really looking forward to if I get this fight. Hearing all his trash talking and him trying to sell the fight or whatever. I’ll let the talking in the cage be done and after that I can run my mouth a little bit." Despite Johnson saying that he has no personal problems with Diaz, he also doesn’t mind firing off a couple of warning shots at his head just to let his potential next opponent know that he’s ready for anything before, during or after the fight. 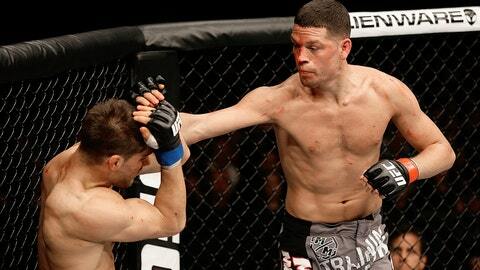 Nate Diaz punches Josh Thomson in their lightweight bout during the UFC on FOX event at the HP Pavilion on April 20, 2013 in San Jose, California. It’s also become commonplace for fighters taking on one of the Diaz brothers to have teammates and training partners try to emulate their antics inside the cage to help get ready for what will actually happen in the Octagon. Johnson is surrounded by plenty of outspoken types at his camp in Florida, although there’s one physical requirement none of them can match with Diaz. 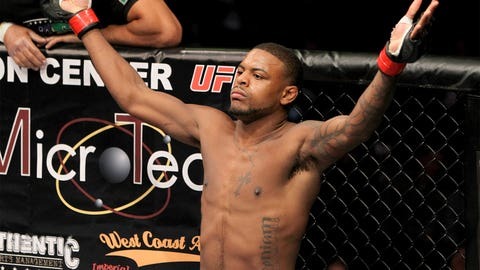 "As far as attitude who can mimic him pretty well, Rashad (Evans) could definitely be one. Eddie Alvarez could probably pull it off to do some of the facial expressions he does. But we don’t have any skinny guys who think that they’re really buff who flex all the time. That’s going to be pretty hard to do," Johnson said. "We could find somebody to do it." Johnson is fairly confident in his ability to stop Diaz and get his third win in a row so until the UFC tells him he’s fighting someone else, that’s who he’s going to keep gunning to get in the cage. Judging by his words thus far, Johnson certainly seems aware of what he’s got to do to land the fight — now it’s just a matter of getting the UFC and Diaz on board.